Morecambe could have a record crowd for a Football League game at the Globe Arena when Carlisle make the short trip south on Boxing Day. The current record at the Shrimps’ Westgate home stands at 4,025 for Bradford’s League 2 visit in September 2011. The visitors have sold out their allocation of 1,770 tickets with time to spare meaning everything is pointing towards a new high for the Globe Arena. General manager Mark Dixon said: “We’ve been in close communications with Carlisle and they’ve been pretty forthright in the view that they would sell out quickly. “And fair to the word they sold out within the first week which is just a fabulous response. “They’re a big club all be it they’re going through a tough time both on and off the pitch. “But coming 60 miles down the road on Boxing Day has ignited their passion and they’re coming to see us. “We haven’t seen an away following like that in league terms since we had Bradford here so everything being equal and the weather gods smiling on us as they have done in the last few fixtures then 4,000 plus is on the cards. Mr Dixon is confident the Shrimps players will thrive in front of a big crowd on one of the most anticipated days of the football calender. 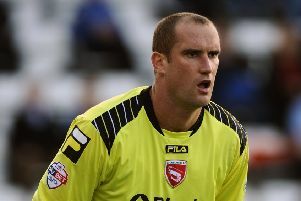 He said: “We really enjoy the festive fixtures and they seem to grab the attention of the Morecambe public. “There’s people who work away and it might be the only game they come to all season but everyone comes in with a good spirit, good noise, it’ll be a great atmosphere.